Who is Seeds of Hope? Our most basic purpose is to engage Christians to act on Christ's commission to care for the poor and helpless of the world, and to encourage and inspire those who do. We believe that Christians respond with compassion and energy when they are informed about the realities of poverty in the world, and when they are offered specific, creative ways to act. We exist to provide that information, and to make our readers aware of the wide variety of ministries and opportunities for participation available to them. Seeds is a 501(c)(3) non-profit organization. What does Seeds of Hope do? Sacred Seasons - worship packets with a biblical emphasis on the healing of hunger and poverty. 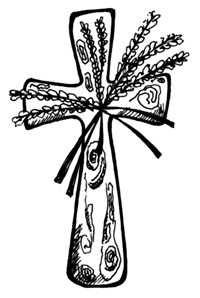 Published to coincide with seasons of the church calendar, these packets contain over twenty pages of sermons, poetry, art, litanies, youth and children's activities and other resources for ministers who are seeking creative ways to integrate concern for "the least of these" into regular church worship and education. Each year, we produce a packet for Advent and Christmastide, one for Lent and Eastertide, and a Hunger Emphasis packet for the fall. Hunger News & Hope - an award-winning newsletter dedicated to enabling and empowering a variety of responses to the problems of poverty. HNH pulls together news, essays, useful statistics, inspiring quotes and sayings, and information about useful resources into a concise, readable format. It is distributed quarterly through eight denominations to thousands of Christian hunger educators. In addition to these, we produce curriculum for hunger workshops (Hunger in God's World), collections of sermons about hunger, collections of activities for youth and children, and other creative and (we hope) useful resources. On our website, you will find features that are not in our print publications, like Hunger Bytes (blogs about hunger issues), a section called "Where Are People Hungry?" and a section called "Why are People Hungry?" We are a group of people who have come together because of a common burden that each of us feels for those of God's children who are without the necessities of life, and for Christians whose lives could be enriched and blessed by responding to the hungry and poor. More specifically, we have come together to produce publications which will inform Christian people about the realities of hunger and poverty, and offer a variety of positive ways to respond to the needs of the poor. We feel that many people of Christian faith would respond in love if they were better informed, and if they were offered creative and specific ways to act. We also believe that those who already labor to feed the poor need to be affirmed and inspired to continue their work. We hope to speak to those people as well. We are acting on the strong belief that the many biblical mandates to feed the poor were not intended to be optional, and we are responding to those commands with joy-out of our own sense of gratitude for the abundance in our lives. Each of us has had experience in ministering to fellow human beings who are impoverished, and this experience has been so profound to each that it has significantly affected our worldview and has become a priority in our lives. Each of us seeks to move from being a part of the complex problems that cause hunger and poverty, to become with our lives even a small part of a solution. We recognize that different people within the commonwealth of God possess different gifts that are essential to respond to the needs of the poor, and we seek to affirm, enable, and empower a variety of approaches to the solution of poverty and hunger. We feel a call to encourage each other to grow and to find ways to improve our ministries to the poor and hungry. We believe that we have been given a burden-the capacity to wrestle with the realities that cause and are caused by poverty and hunger, and we feel called to use all of the resources we represent in responding to our brothers and sisters who suffer from poverty and hunger. We acknowledge that we all operate as earthen vessels for the grace of God. We intend to be honest and unflinching in our assessments of each other, without bitterness or acrimony. We hope to call forth gifts with encouragement rather than condemning the efforts of those who labor to feed the poor. This group does not directly support any single feeding organization or poverty program. Our purpose is to inform our readers of a variety of ministries around the world, and to present options for participation in a ministry that suits each reader. We believe strongly that ours is a hopeful mission, and we seek ways to respond positively to this tragedy, while avoiding the temptation to generate guilt or despair in ourselves or in others. Seeds of Hope Publisher is housed by the community of faith at Seventh and James Baptist Church. The mailing address is 602 James Avenue, Waco, Texas 76706; Phone: 254/ 755-7745; Fax: 254/753-1909; E-mail: seedseditor1@gmail.com. Copyright © 2014; ISSN 0194-4495. Seeds of Hope, Inc., holds the 501(c)3 nonprofit tax status. Scripture quotations, unless otherwise noted, are from the New Revised Standard Version, Copyright © 2003 by the National Council of Churches of Christ in the U.S.A. Used by permission.